How many deductions should you make on your W-4? My HR person suggested that I only take 1 deduction because I “would get a bigger refund.” Just looking it over though, I didn’t seem to get that huge of a refund this year (about $600) to merit having so much taken from each paycheck. I could take at least 4 deductions now with the family and could have up to 7 by the time I start my full-time job after pharmacy school. Of course, I will be making a lot more then so would it come back to bite me come April 15? These are the things I ask myself during a boring lecture. AJ’s question is one a lot of my friends and family ask, but they always seem to get a different answer depending on who they ask. A lot of people say, like AJ’s HR person, that by taking the least amount of deductions you can “get a bigger refund” come tax time. The bigger refund, however, is only the result of Uncle Sam taking too much from your paycheck each month and then being forced to hand you the excess in April. There are a few things wrong with this way of thinking. The first (and biggest) problem is that this method gives Uncle Sam an interest-free loan throughout the year. Banks don’t seem to do this, so why should you? The second biggest problem is that instead of giving away free money, you could actually be earning money on that amount. Imagine, for instance, that Uncle Sam was taking $100 too much from each paycheck of yours. After 24 paychecks or so you will have given the Government $2,400. When tax season arrives, the Government will give you your $2,400 back, but not a cent more. However, if you had filled out your W-4 correctly and invested that $100 in just an online savings account earning about 5.25% you could earn yourself a cool $60. It doesn’t seem like a lot, but it’s better than giving it to Uncle Sam – which is what you are effectively doing by giving HIM the free loan. So how should you fill out your W-4? My advice is to work backwards. 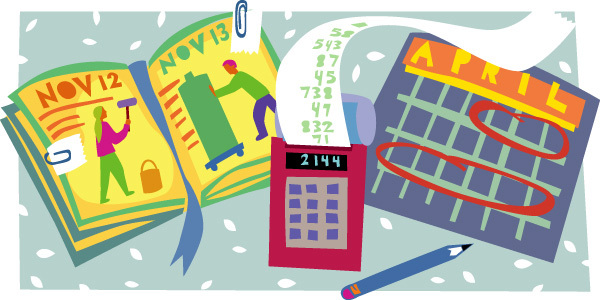 Step 1: Look at last year’s tax return, use a simple online calculator, or even your favorite tax program to estimate what your taxes are going to be for the year. Step 2: Using that amount, you’ll want to choose the amount of deductions that will (honestly) allow your employer to withhold enough taxes so that by the end of the year you’ll owe $0 in taxes, and Uncle Sam won’t owe you a dime either. You can use a simple W-4 calculator like this one, or go for something fancy like this one. Whichever one you choose, you can tweak the amount of deductions made and see what the final deduction amount will be after one year. Remember, your goal is for your withholdings to match your estimated tax bill. That’s it! Only two steps. Now of course your situation will change. You’ll earn a little more, or be able to deduct a little less in April, but hopefully by the time taxes are due, you’ll only owe a small amount. And if you’ve been saving that extra amount that would have normally been deducted, you can even pay that small amount due with your earned interest! Thanks for the great response. I’ll be changing my W 4 shortly. Is there a max number of exemptions a person can claim? I currently claim 15 and still have way too much withheld. My fed tax overpayments is usually close to $1000. Great info. We are getting thousands back this year…mistake. So we’ll be changing our deductions this week. Thanks for the links. I am single, divorced and head of household. I am a fulltime student and make less than 30K. I don’t what to claim on my W-4 and have 2 kids less than 18 1 that lives with me half of the year…please advise…. Every source I have found indicates the maximum number of “allowances” you can claim on your W4 is 10. This works out to be 13% of my income and the $ amount is very near to my tax liability for this year. Previously, I had 6 allowances and that was about 17% of my taxable income. It was ~22% when I used to claim 0. So those three data points support a cap of 22% and approximately -1% for each allowance. I too wanted to keep all of my money, invest it and pay at the end of the year but the IRS wants to reap interest from our money–and with our deficit as high as it is, they need all the interest they can get. 🙂 So claim up to 10 and it will work for the majority of people. My income is higher than the average married couple and 10 is perfect for me. Correction, the form W4 allowance worksheet lists 10 for single and 15 for married filing jointly. So if you are single you may have 10 allowances and if you are married filing jointly you may have 15. This advice has been around for years–and is all over the net. In point of fact, though, if you fill out the W-4s honestly, you’ll discover that you likely cannot claim any more exemptions than you already do! Plus, given the straits of the government, I’m happy to lend them $1,000-2,000 for the year. At current interest rates, I’m probably losing $10. But our combined letting Uncle Sam have helps cushion the deficit. Of course, having written that, let’s keep in mind that the real way to solve the debt and deficit “crises” is through real, honest to goodness progressive taxation.